My family loves a spicy dinner and I love a meal that is naturally gluten-free and easy to convert to vegetarian. 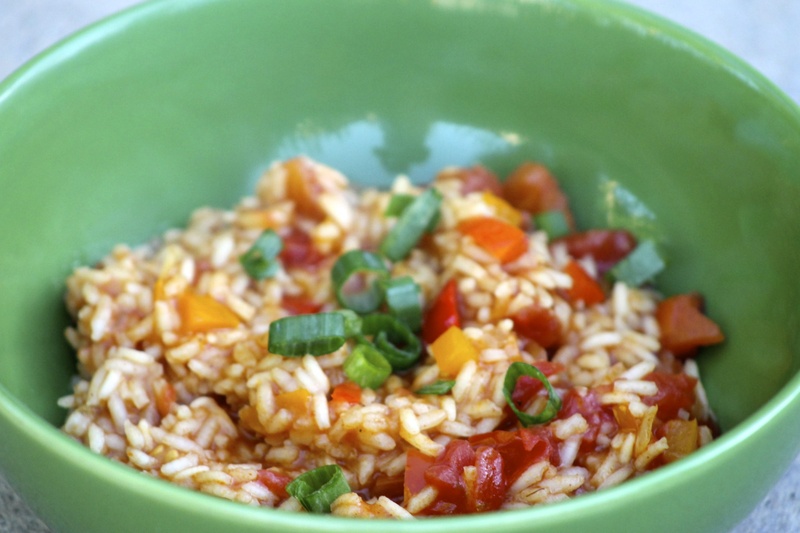 I found this hearty turkey jambalaya recipe a few years ago and it is on permanent rotation for us. It’s a quick and easy option for busy school nights. If you like heat, you might need to add a bit more red pepper but this version is perfect for the kids. Give it a try and let me know what you think. 1. Heat oil in a large Dutch oven over medium-high heat. Add chopped onion and garlic; sauté 6 minutes or until lightly browned. Stir in bell peppers and next 5 ingredients; sauté 1 minute. Add rice; sauté 1 minute. Stir in broth and tomatoes; bring to a boil. Cover, and reduce heat, and simmer 15 minutes. If using turkey sausage, add it now, cover and cook 5 minutes. Sprinkle with green onions. Makes about 8 cups. The F.D.A. set new standards for gluten-free labeled foods today. Check this post for more information from Jules Gluten Free. As a busy working Mom, I am always looking for quick and easy recipes that are safe for my gluten-free and vegan 11 year-old. 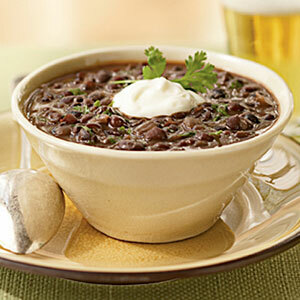 This hearty and fiber-rich black bean soup simmered away in my crock pot for two days and the high protein was a much needed added plus. We served it with gluten-free bread and vegan butter spread on a cold snowy night. My son thought it tasted like the black beans he eats at Chipotle. Give it a try and let me know what you think. 1. Sort and wash beans; place in a large bowl. Cover with water to 2 inches above beans; cover and let stand 8 hours. Drain. 2. Combine beans, broth, and next 5 ingredients in a crock pot. Cover and cook on LOW 10 hours. Discard bay leaves. Stir in juice and salt. Ladle 1 1/2 cups soup into each of 6 bowls; sprinkle each with 2 teaspoons chopped cilantro. I am sorry about the lack of yummy gluten-free posts lately. I have re-entered the work force and am trying to figure out how to balance it all. I haven’t figured it out yet but I have been making lots of tasty gluten-free meals that I have been dying to share with you. So, to celebrate the warm weather finally arriving here in Denver I have been grilling like crazy. Here I share one of my new favs. Gluten-Free, dairy free Southwestern-Style Shrimp Taco Salad. Even my 3 kids liked this one and it is on a permanent rotation in our house for the summer. Enjoy! 2. Combine lime juice, olive oil, cumin, garlic, syrup, and hot sauce in a small bowl, stirring with a whisk. Place the shrimp in a shallow bowl. Drizzle 1 tablespoon of the lime juice mixture over shrimp, tossing gently to coat. Reserve the remaining lime juice mixture; set aside. Thread shrimp onto metal skewers. Lightly coat corn with cooking spray. Place shrimp kebabs and corn on a grill rack coated with cooking spray. Grill 8 minutes, turning kebabs once and turning corn frequently until browned. Remove from grill; cool slightly. 3. Remove shrimp from skewers, and place in a large bowl. Cut kernels from ears of corn. 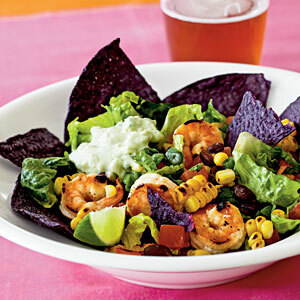 Add corn, chopped lettuce, green onions, cilantro, black beans, and plum tomatoes to shrimp. Drizzle reserved lime juice mixture over the shrimp mixture, and toss gently to combine. 4. Divide tortilla chips evenly among 6 shallow bowls; top each serving with 1 cup shrimp mixture. Mash avocado in a small bowl. Top each serving with avocado. Serve with a lime wedge, if desired. Snyder’s of Hanover must have heard an earful from the gluten-free community regarding the certification of new gluten-free pretzels. Read the post. Here is the response I got from a letter I wrote. I must say I am still hesitant to allow my gluten-free kid (GFK) to eat these given the attitude these guys had prior. What do you think? Is this letter satisfactory? Will you purchase these pretzels? Snyder’s of Hanover is pleased to announce that our new Gluten Free Pretzel Sticks have been tested by Silliker Labs, an international leader in food safety and quality testing and have surpassed the Food and Drug Administration (FDA) proposed guideline for gluten free claims of <20 parts per million per serving. Though the FDA has not given final guidance on this issue, Snyder’s of Hanover has adopted the <20 ppm as our standard for making a gluten free claim. According to Silliker Labs, our gluten free pretzels actually tested at <5 parts per million per serving on multiple tests conducted during the product development stage. We will continue to test our product through this respected laboratory to ensure we maintain this level of compliance. Snyder’s of Hanover has been in business for over 100 years. We are a third generation, family owned and operated company that values the integrity and quality of our products above all else. You can rest assured that our new Gluten Free Pretzel Sticks have been thoroughly tested and are in full compliance to insure the safety of consumers in the gluten free community. I received the following from two people who I really respect in the gluten-free community. Please read. These pretzels won’t be entering my house and I hope not yours either. Are you willing to be poisoned? For profit? I apologize for the alarm, but where food safety and our health are concerned, silence is not an option. I hope you agree. This month I met a senior executive of a food company that is launching a new gluten-free product. When I asked why their product was not certified gluten-free,　I was discouraged (because I usually only eat products that are certified). As we discussed their reasons, and their casual and dangerous interpretation of what “gluten free” means,my stomach knotted,　by blood pressure rose and I was moved to write a letter to their CEO. Please read the letter,　and join me and thousands of gluten-free consumers who will not be taken advantage of for profit’s sake. The incredible growth of the gluten-free segment of the food industry is usually a positive development for those of us adhering to this eating style. But this growth also is fraught with perils,　as uncaring, uninformed companies disregard our health in their eager attempts to capture their share of our dollars. I’ve long compelled my readers to not patronize companies that produce inferior products; to not compromise on taste. Nor should we blindly flock like underfed lemmings to the snack food aisle to purchase the latest “gluten-free” offerings…without proof of the companies’ commitment to protecting our health. Until now, I had nothing against this company, but in light of what I learned directly from a senior executive, I feel nothing but an all-out boycott of this product by the gluten-free community will suffice. We need to send a message that our collective purchasing power is powerful indeed. And that gluten-free consumers deserve the safety,　care and accountability that marketing a product to us demands. Your swift and committed response will send a message not only to this company,　but will serve as a warning to others who want to capitalize on us without doing their diligence. Don’t remain silent. Exercise your right! Voice your concerns by contacting the President and CEO of Snyder’s of Hanover directly, Mr. Carl Lee at SOH@snyders-han.com. Then please pass on this letter to all those you care about who live gluten free. The gluten-free community is a tight-knit one,　indeed. Let’s harness the power we have in our numbers,　and raise our voices. We will not be exploited! Your company has undoubtedly identified the gluten-free segment of the food market as a high-growth opportunity. You are about to learn how vital truly gluten-free foods are to the health of this same population – a population which can be very vocal when they think they are being taken advantage of and when their health is placed in jeopardy. I met with your Vice President of Marketing at Expo West and engaged him in a discussion about your new gluten-free pretzels. I was initially excited about this brand new offering, but I soon became horrified at your company’s reckless disregard for the safety of the population to which you hope to market this product. When I asked about why Snyder’s isn’t GF certified, your VP of Marketing, Rudi Fischer, brushed off the notion, explaining that the company had explored the requirements of certification, and “didn’t want the headaches” that came with it. He elaborated that Snyder’s didn’t want to have to do any product recalls or lose inventory because any given run may test at over 20 ppm gluten. He even threw out the example that if someone “forgot to wash down the line” between gluten and gluten-free runs, he didn’t want to have to “report to anyone else, pull inventory or do any recalls of product”. He went so far as to say that although the bags are currently labeled “Gluten Free” and also “Wheat Free,” the company is actually going to take off the “Wheat Free” designation since the products are run with wheat products and are potentially contaminated with wheat. Shockingly, he indicated that the “Gluten Free” label will remain, however. This 3-ppm increase in gluten could trigger any number of symptoms in celiacs, or in those who “merely” eat gluten free, ranging from painful gastrointestinal symptoms like diarrhea and cramping, to nutrient malabsorption, painful skin lesions, joint inflammation, fatigue, infertility and miscarriage, and of course, headaches – although apparently ours are not as serious as the headaches your VP indicated would come with gluten-free certification. I spent the afternoon before the Expo speaking at the Healthy Baking Seminar to more than 130 manufacturers who wanted to get gluten free right. Small and large companies which are willing to invest in educating themselves about the onerous responsibility of gluten-free food safety as well as the market opportunity it represents. They know, as I wish your company did, that gluten free is not just about a market opportunity. It is a responsibility manufacturers bear when they enter this marketplace. Did you do more than buy the SPINS report, or did you actually talk to gluten-free consumers? In any of your focus groups, did anyone say that a 3-ppm increase (or more) in gluten is acceptable? One-eighth of a teaspoon of gluten-containing flour can cause a chain reaction of painful symptoms in gluten-free consumers from which it may take weeks to recover. The manufacturers who take this responsibility seriously and produce good products — the ones who do it right — like Glutino, can make “a killing.” The ones who disregard the importance of the responsibility they bear, like Great Specialty Products (recently indicted in North Carolina on six counts of obtaining property by false pretenses by marketing bread as gluten-free that was not, in fact, gluten-free), will have far more to deal with than poor sales. This is a critical juncture for Snyder’s entering this market. As you will see, all eyes are now on you; you have the opportunity to do the right thing. If your product recovers from this misinformed beginning, it will be by finding an organization who is willing to train and certify you – and believe that when they walk out the door you will uphold their standards. It will also come from taking the time to understand your market and ingrain yourself into the gluten-free community by funding celiac research, by supporting efforts to raise awareness for the needs of the gluten-free community, and by proactively lobbying for tougher — not looser — labeling protocols. Take the high road and redeem your company, leading the category by example, or your “gluten-free” products will fail and much good will toward your company will be squandered. We love chinese food around here and it’s something all 5 of us will actually eat. It can be very tricky taking a gluten-free kid (GFK) out to a chinese restaurant because of all of the soy sauce and peanut oil issues (he’s also allergic to almost all proteins, including nuts). 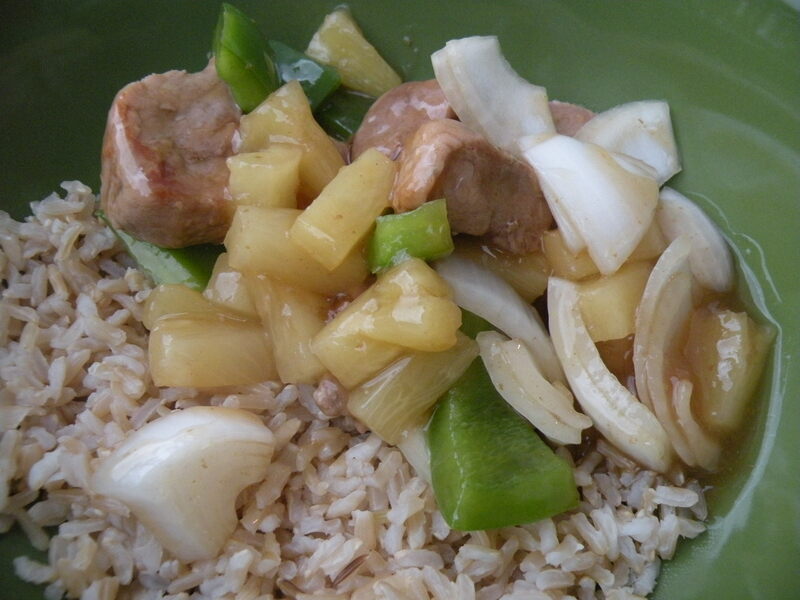 So, last night I made Sweet and Sour Pork, one of our favorite dishes and naturally gluten-free! Give it a try and let me know your favorite gluten-free chinese dish. Heat a nonstick skillet coated with cooking spray over medium-high heat. Add pork and cook until golden brown, about 8 to 10 minutes; remove from skillet and set aside. Drain any remaining fat from skillet. Drain pineapple chunks, reserving juice; set aside. Combine water, vinegar, sugar, cornstarch, salt, soy sauce and reserved pineapple juice in a small bowl; add to skillet and cook until sauce is slightly thickened, about 2 minutes. Add pork; cook covered over low heat until meat is tender, stirring occasionally, about 30 minutes. Add peppers, onion and pineapple chunks; cook 5 minutes. Serve over rice. Yields about 1 cup of pork and 1/2 cup of rice per serving.